The countdown is on for the Centennial Celebration of the 19th Amendment — and Feminists for Life of America is petitioning the U.S. Department of the Treasury to release the new $10 bill with images of American feminists and abolitionists by this celebration in 2020. FFL celebrated the announcement by the U.S. Treasury that abolitionists and first wave feminists Susan B. Anthony, Elizabeth Cady Stanton, Lucretia Mott, Sojourner Truth, and Alice Paul will grace the back of the new $10 bill. Harriet Tubman will also be featured on the front of the new $20 bill. Disappointingly, the U.S. Treasury will not commit to ensuring that the $10 bills will be in circulation by 2020. With four years of lead time, we strongly urge the U.S. Department of the Treasury to ensure that the bills will be in circulation in time for the Centennial Celebration of the 19th Amendment on August 18, 2020. Please sign our petition right now and build momentum as we honor these women — abolitionists and first wave feminists — and to educate others about their numerous accomplishments and support for mothers and children — born and unborn! 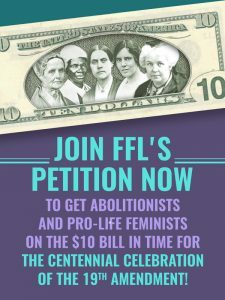 PS: Please share this page and help us grow this petition to get abolitionists and pro-life feminists on the $10 bill in time for the Centennial. And please consider a gift to FFL in support of our revolution as we fulfill the unrealized vision of Susan B. Anthony and other early American feminists!